Did you get that movie reference? What kind of Canadian are you? 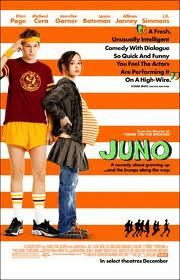 Come over to my house and we'll have a Juno viewing party. I'll greet you at the door with "Yo yo yiggity yo". That's how I answer the phone sometimes. Although today I was called a nerd, geek and granola. Who says those things aren't cool? I'm so excited to be back on the blog wagon that I wanted to introduce you to some of the blogs that I read and am inspired by. Ali's blog is a beautiful mix of fantastic stories about her growing music career as a brilliant fiddler (I know she plays other instruments but I don't know what they are), life as a Christian woman, wife, daughter and friend living in Toronto and totally random stuff that I don't know how to categorize. You will be thoroughly entertained and moved by what you read. Trust me! I'm not sure how I came across this blog a few months ago but I'm sure glad that I did. Karen writes for every plus-sized Canadian girl. Her blog is full of great tips on where to shop, products she's tried, contests and daily outfits modeled by Karen herself! It is such an empowering read for any woman who has felt outside of the norm of what our society considers beautiful. Karen's recent post Six Take: No H8 really hit home for me as someone who was teased as a teenager because of my weight. Thanks Jenny Craig for having such a catchy jingle that even 12 year old boys could remember it and sing it to me. Sorry. Deep breaths. Kathy's blog is pretty much exactly what the title says. A great resource for parents who want to take care of the planet while they take care of their kids. It is full of great tips on products and services to help make it easier to do. She even has a great store called My Lil Sweet Pea where she sells lots of great products. The cloth diapers were so cute I wanted to buy them. But my cat wouldn't like it if I put diapers on her. She's a free spirit. Remember how I said someone called me "granola" today? Ahem. I blame this beauty and the inspiring ideas she puts out into cyber space for my new found passion for thinking outside of my plastic bag. Mare offers up great ideas and solutions to the challenges that those who want to leave the earth a better place than when we found it face every day. She is a supermom who bakes bread for her Boyes and encourages you to think about how you live everyday. I am changed for the better. Nadine's blog is beyond brilliant! It is a fun read for anyone who loves pop culture, fashion, Jesus, beauty and honest accounts of what it means to be a women/daughter/sister/cousin/Sunday school teacher/fiancee/writer following a different path in this culture of "more is more". She will make you feel like you're listening to your bestie tell you about her day! Your homework has been assigned. And if you have a blog I should be reading let me know about it!